To do this I’m using p2 ant tasks for mirroring repositories. then, switching to my local mirror for target materialization it’s just a matter of passing for the property eclipse.download the URL of my local directory, e.g., file:/home/bettini/eclipsemirror, without even changing my RMAP files. So let’s start mirroring! We need to define an Ant script for the p2 antRunner. 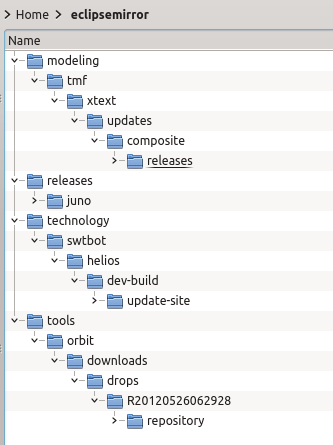 Note that we keep in the target dir the same path structure of the original repository. Of course you can choose any target dir; the idea is however to always use the same target dir so that all repositories will be mirrored in that path. This task will mirror all the features that should let you define a target platform for RCP development with EMF and CDO. NOTE: if you try to mirror org.eclipse.platform.sdk from the releases/juno repository, you will see that it will actually mirror the whole repository! (see also this forum post). If you get some warnings during the mirror about unsolvable dependencies, you can ignore them: basically those dependencies are in a different repositories, and probably you will mirror those repositories too later. Final warning: it might take some time for the mirror task to complete (usually hours depending on your connection and download.eclipse.org load) and it will also take some hard disk space (for the above mirror it takes about 2 Gb). There’s also a follow up post showing how to run this ant task from Eclipse! This entry was posted in Tips and Tricks and tagged eclipse, p2 on November 22, 2012 by Lorenzo Bettini. Hi Lorenzo, nice article. I was previously mirroring repos using both org.eclipse.equinox.p2.metadata.repository.mirrorApplication and org.eclipse.equinox.p2.artifact.repository.mirrorApplication. While these save me from having to create the ant script, I have found that your approach is more flexible since specific features/versions can be selected. I am currently trying to create a complete mirror of the latest version of the m2e-wtp project (https://www.eclipse.org/m2e-wtp/download/). Is there an easy way to determine the exact artifacts to include in the ant script? I can obviously mirror the metadata and then copy the latest version of all features to the ant script, but that process is very manual and annoying to repeat every time a new version is released. Is there a flag like “getLatestOnly” or something like that?